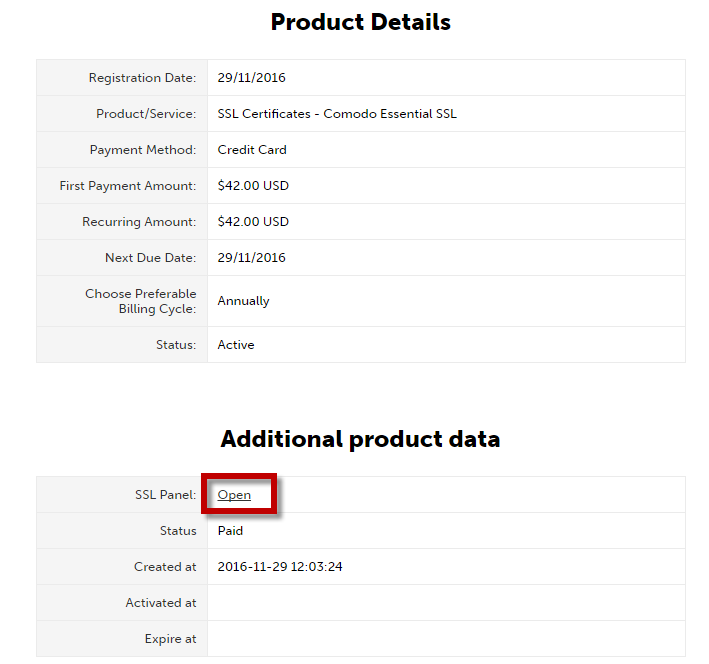 This guide will show you how to easily activate a trusted SSL certificate purchased at VPS.US. When you first make an order at VPS.US, you receive client area password over the email. Once you're in in the client area, click on My products & Services to overview all the services you ordered with us. Now you are on the page with all your services ever ordered with us. Here you can see the name of the certificate, its price and its next due date. Please mind that before your order is reviewed by our billing team, the certificate field is colored white. After the order is checked and accepted, the field will be green. When you receive the activation notification, proceed to certificate configuration by clicking on Details button to the right from the service name. You can have a closer look on the details of a chosen service. Click on the Open button to proceed. 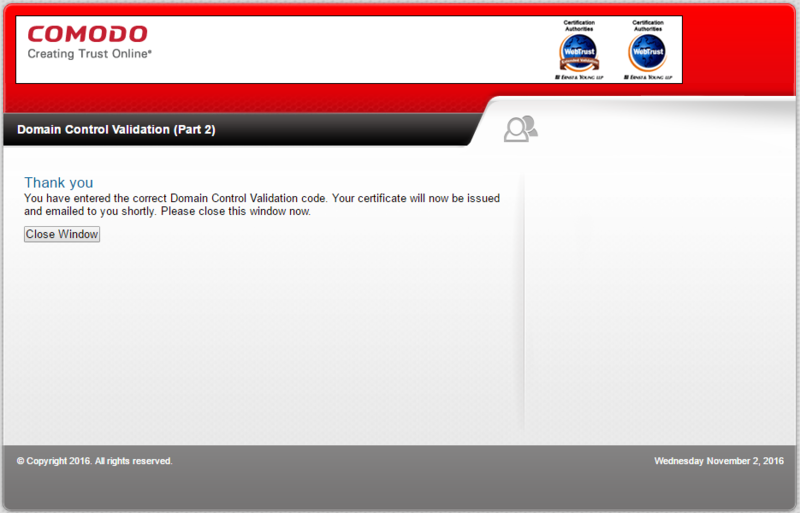 Finally, you are on the page where we can configure the certificate. Press Edit/Request button. Here you need to paste the Certificate Signing Request (CSR). If you don't know what a CSR is and how to generate it, use a CSR generator in SSL panel, or what is more secure, ask your hosting provider to generate one for you. The CSR will include the following information: Domain, Organization, Department, City, State/Province, Country, E-mail. Please make sure you save the RSA key generated with a CSR. RSA is a private key required to install a certificate. If you lose RSA, you will need to re-issue the certificate. 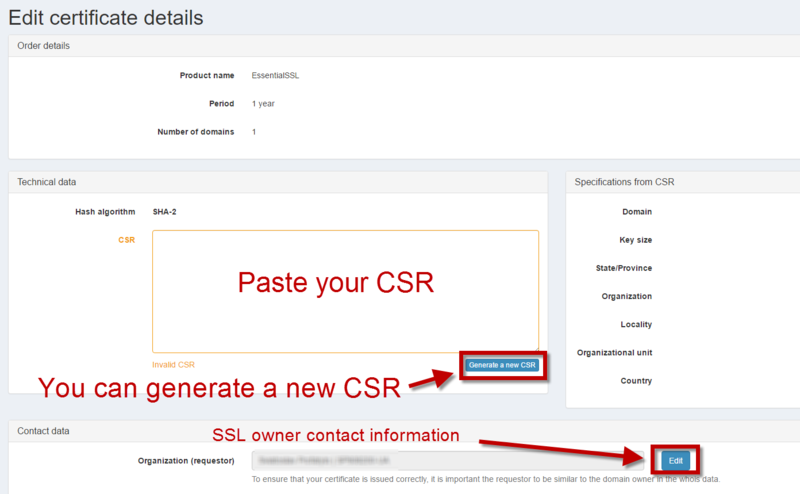 Now, paste CSR in its field and check the contact information of the certificate owner. We auto-fill some fields with the data you indicated during registration with us. If you need to change this info for a certificate, no problems – go ahead. Use only Latin letters. NB If you ordered a Domain Validation certificate, you need to perform steps 5 and 6 of this guide. If you ordered Organization or Extended Validation certificate, you will have to stop here and go on to communicate with the Certificate Authority (CA) on the company documents they will ask you for. Only Comodo CA asks for E-mail validation in case of OV / EV certificate. You can choose the one you consider most suitable for you. In this case we will describe the most popular and easy to complete type – E-mail validation. Choose email to which a confirmation message will be sent. 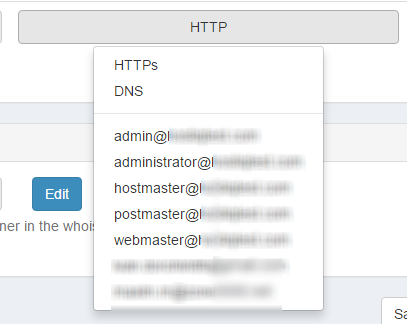 Beside providing encrypted connection, a domain control validation certificates, guarantees that a user sends data to the initially intended website. If a user is going to buy something at ebay.com, he or she clicks on the padlock in their browser and can see the domain ebay.com. Thus a CA guarantees the data is sent to the right place. 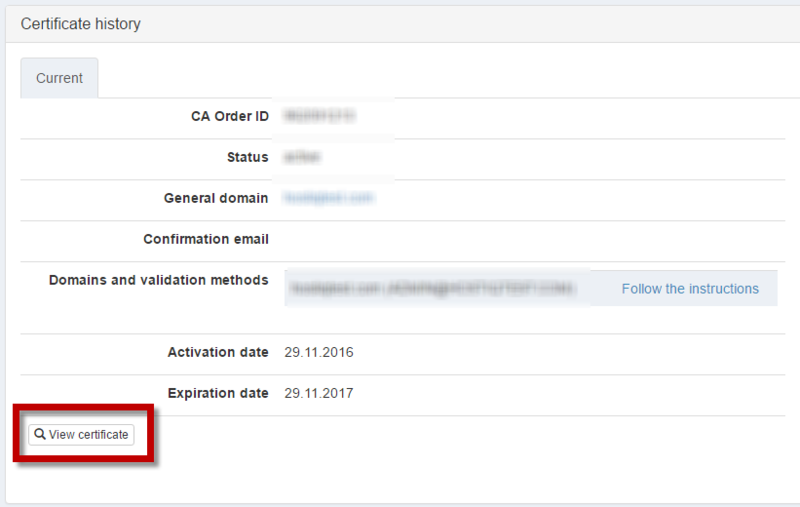 That is why if you would like to receive a certificate for ebay.com, you have to prove you own this domain or manage it at least. Choose the one you have access to or create one. After you choose the validation option, click Request. Now you can see the confirmation that the information has been sent to the CA. After you submit information to the CA, they send a validation message to the email chosen on the previous step. It is usually delivered within 2 hours at most. In case of a delay, please contact us. We will request an email to be resent. You can see the sample letter from Comodo CA below. There you will find a link and a secret code. Click on the suggested link to see the details of the order and click Next to paste the secret code and thus confirm the issuance. Press Next. That's it. The activation is done. The status of the certificate is displayed in the panel. 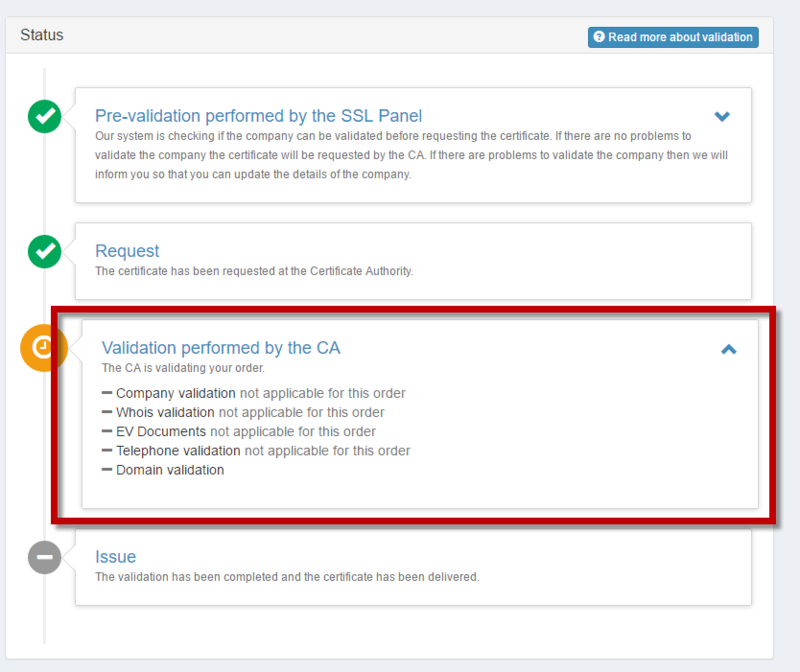 Once the CA completes a validation process, the certificate will be issued and available for download from SSL panel. 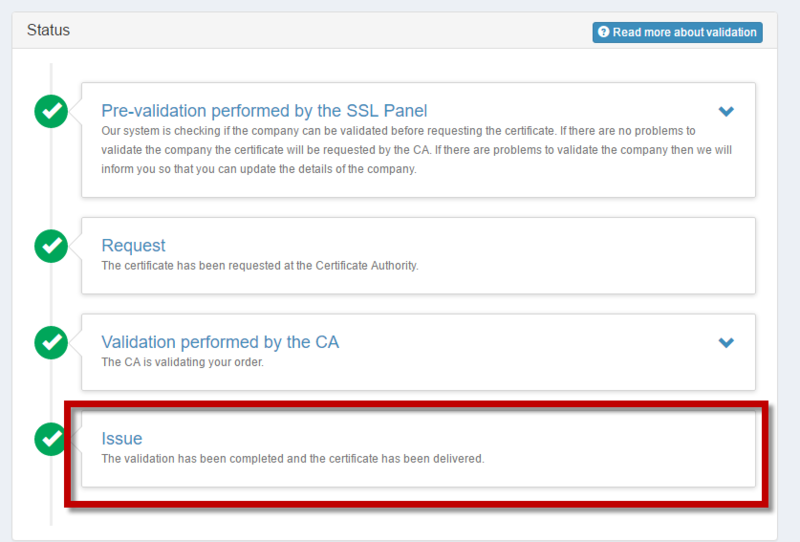 You can always check the certificate status, which is displayed in SSL panel. To get the certificate, go to the View Certificate option. There you can download a chain of certificates. If you need help with the certificate installation on your VPS with us, please contact our technical department via the ticket system.